Shoppers Drug Mart has a Spring It On contest! 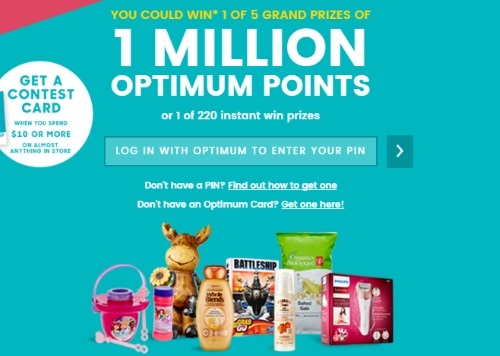 Enter to win 1 of 5 prizes of 1 Million Optimum Points or 1 of 220 instant win prizes! Get a contest card in-store when you spend $10 or more on almost anything in the store. You can also complete the No Purchase Necessary Request Form to enter without making a purchase if you prefer. Along with the 1 Million Optimum Points prize there are also instant win prizes of $25, $50 and $100 Shoppers Drug Mart gift cards! Contest closes April 24, 2016. Limit 10 chances per person, per day. Half the time the clerks forget to give the customer a contest card . It would be so much better if Shoppers could automatically enter the customer into the contest when the customer hands them their Shopper's Points ' card . That would be an excellent way of cutting down on paper and saving some trees . Also one wonders what happens to all the contest cards that the customers never gets .Do they go to friends of the people that work for SHOPPERS DRUG MART ??????? I always ask for a contest card if I shop here, because yes the cashiers don't often give them out.